Michigan has added a defenseman to their commit list. Kevin Lohan out of the BCHL committed to the Wolverines today and will join Michigan in either the 2013-14 or the 2014-15 season. He's already 19 years old and is listed at 6'5", 210. He plays for the Merritt Centennials. Lohan has a 3-11--14 line in 40 games with 18 PIMs. Previously he played for the New York Apple Core. A couple of season ago he also skated for Shattuck St. Mary's. [Lohan] has shown tremendous growth here as a player and is well deserving of this opportunity. He has been a tremendous addition to our hockey club as his character has fit in seamlessly with our environment here. He has become a big-minute player for us and has provided a very calming presence amongst our defence core. With his size and intelligence he has been able to establish himself as an elite player in our league. Lohan may have to be known as "Kevin Lohan (YTL)" because, yes, that Lohan. His cousin is actress Lindsay Lohan. Their fathers are brothers. Thanks to Dave Starman for pointing out that fact and to Matt Slovin for confirming it. That gives the Wolverines up to 30 players for next year's roster. They're clearly covering their bases in the event of Merrill and/or Trouba not returning or some unexpected departures/guys not making it to campus. And they might not be done. Mike Spath reported that Michigan is actively seeking a goalie for next season, using the scholarship money freed up by Milne's departure. I don't want to say any more than that because it's a premium link, but the info will come out soon enough. We haven't heard any names yet, but I'm kind of intrigued. I might get to bring back one of my favorite phrases! I apologize for the lack of content lately. It's hard to get up the energy to write about games that you don't actually get to see, especially when the results aren't good. On the plus side, Red called their split with LSSU their best weekend of hockey on the season. They followed it up with a competitive game against WMU before a much-less competitive game against WMU. Is that progress? Maybe? I mean, that's three not-bad games out of four, right? Michigan came into this week with three home games against two teams toward the bottom of the CCHA Standings. The hope was for 9 points to start digging themselves out of the hole that they're in. The more realistic goal was for ~6 points, which would at least go a long way toward home ice in the first round of the CCHAs. The grand total was 0 points. After the debacle against Bowling Green, the Wolverines were swept by Alaska 5-4 and 4-1, dropping them to 7-13-2 overall, 4-10-2-2 in the CCHA, and an ugly 6-8-0 at home. The Wolverines haven't won consecutive games since the 2nd, 3rd, and 4th games of the year and they've won just 4 of the past 18. The offense has plummeted to 28th (2.77 goals again) and now sits just five slots above Penn State. Let's put that one in perspective before we move on. Last year, the Wolverines scored 132 goals, which was the lowest total of my lifetime. They averaged 3.22 goals per game. We're almost a half a goal per game below that right now. The defense is 54th out of 59. The only teams worse defensively are RIT, Colorado College (! ), American, Alabama-Huntsville, and Sacred Heart (who is a full goal worse than UAH). They're giving up 3.5 goals per game, which, you could shave a goal per game off of that and still barely crack the top 20 nationally. The power play is dreadful. Last year's 14.7% was bad. This year? They're sitting at 12.9%, but if you factor in the 4 shorties they've given up, you're really talking an effective percentage of more like 8.6%. Trouba has 5 of the 12 goals. The penalty kill looks sparkling in comparison. That's at 82.0% (or 84.3% with the shorties factored in), 36th in the country. Red said they were focusing on defense, and they still managed to give up 14 goals this week (in 3 games) and change goalies twice. Nothing's getting through. I don't doubt that anyone out there wants to get this fixed more than the players and coaches. At this point, I'd just be satisfied with them saying "We don't have the answers, but no one is outworking us", committing to that, and seeing if that makes a difference. It's not always a lack of effort when a team loses (or is blown out), but the effort has been lacking several times this year. And that's a pride thing. Even when you're in a slump you can still skate hard, complete checks, and forecheck/backcheck like a mofo. You can show up and get beat, but there's no excuse to get outworked. I'm not saying that was the case against Alaska as I didn't see either game, but it was the case against Bowling Green. The Nanooks got on the board first when Merrill fanned on a slapshot. Alaska came back 3 on 2 and the pass got through to Odegard for a tap-in. They took a 2-0 lead when Guptill's drop pass for DeBlois was intercepted. That led to another odd-man rush, but Matthew Friese took it himself and sniped one top corner from the top of the circles for his first of the year. 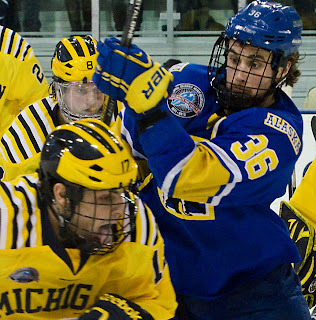 Copp responded the way you'd want Michigan to respond, drawing the Wolverines back within one just 15 seconds later. Kevin Lynch got a puck to the net and Copp chipped a rebound up over the Alaska goaltender. Guptill tied the game thanks to some patience by Derek DeBlois. He controlled the puck just inside the Alaska blueline and spun a couple of times while the Wolverines must have been in the middle of a line change. Ultimately, Guptill streaked down the middle of the ice and DeBlois hit him. There was no one home for Alaska and they let him skate right in and bury one. The excitement was short-lived, however, as Alaska would score just 80 seconds later. Michigan lost a defensive-zone faceoff. The shot from the point was blocked, but the puck bounced around and led to Youngmun having a lot of net to shoot at. He didn't miss. The Nanooks would then regain their two-goal advantage. K. Lynch tried to skate through three guys in the offensive zone and had it poked off his stick. In transition, Cody Kunyk brought it into the zone and paused. He slid a pass rink-wide to the other circle and Quinn beat Racine. Trouba scored before the end of the period, as he was able to knock home a puck that was bouncing around in the slot after Guptill tried to stuff one in on a wraparound. It's was 4-3 heading to the third and the Wolverines replaced Racine with Janecyk. On an early power play, the Wolverines were victimized again. Merrill knelt to try to keep a puck in, but it bounced off of him into the middle of the ice, leading to an Alaska rush. Janecyk made a good save on the initial shot, but the puck sat loose under his pad and it was jammed home by Tyler Morley. Michigan pulled the goalie late in regulation and Zach Hyman found the back of the net to pull Michigan back within one again. Trouba's point shot was blocked by a defenseman over to Hyman and he buried it. The Wolverines wouldn't complete the comeback, however. Saturday night was a battle of special teams, which, as you can imagine, didn't go well for the Wolverines. The teams combined for 27:01 in power play time, 15 power plays, and 21 shots with the man advantage. Michigan was again victimized by a slow start and even though Trouba brought Michigan to within one in the second period, the Nanooks scored twice in a 2:44 span in the third to seal their first sweep of the Wolverines. Alaska had three power plays in the first and capitalized on two of them. With DeBlois off for interference early in the game, Taranto's centering pass from behind the net found Kunyk at the point. He beat Janecyk to give Alaska a 1-0 lead. The Nanooks would strike again on the power play, this time with time running down in the first. Granberg drew the defense toward him out at the point and slid a pass over to an open Atkinson. He blasted a shot and Adam Henderson tipped it home. Guptill had a chance in the waning seconds as Keeney misplayed a puck behind the net. Guptill had to hurry to get a shot off before Keeney could get his stick back in front, and Guptill put it off the outside of the post. With Michigan on the PP for the fourth time in the second period, Trouba bombed one home to cut the lead in half. He just snuck it between Keeney's blocker and the near post. They'd get no closer. In the mid-third, Michigan turned it over at center ice and Kunyk beat Janecyk on a shot similar to the one that Friese scored on the night before against Racine. The one that sealed the game was a truly awful goal--one that had Janecyk kneeling to the ice in disbelief. After PDG was stopped at the other end, Henderson brought it into the Michigan end 1-on-2. He let a harmless wrister go from the top of the circle and Janecyk just misplayed it. He got a chunk of it, but it skipped past him into the net. That was all she wrote. The Nanooks go into their weekend at Notre Dame happy. Michigan falls into a tie with Michigan State for 8th in the CCHA standings (though BGSU is three points back and has 3 games in hand on both teams). The scary part is most of the remainder of the schedule is away from home. The Wolverines only have one game at Yost until March 1 and they face road trips to LSSU, WMU, Notre Dame, and Ohio State. Counting their home series with Ferris, that's 5 of the top 6 in conference that Michigan still has to face. They'll also play a home-and-Joe series with the Spartans. You can lose. You can give up goals. But fergodsakes don't be outworked in a game the rest of this year. Yesterday the St. Michael's Buzzers pipeline to Ann Arbor was tapped once again, with 2014 defenseman Jared Walsh offering up his commitment to the Maize and Blue. Today, however, a former Buzzer is out. Daniel Milne, a freshman forward, left the hockey team to sign with Owen Sound of the OHL. Walsh, a 5'11", 175 blueliner from Toronto, has a goal and 15 assists in 34 games for the Buzzers. He's also got 20 PIMs and six points on the power play. That's good for a tie for 34th in the league amongst defensemen, but 3rd amongst 1996-birthdays. At least 20 of the guys in front of him are either 92s or 93s. He has developed into a very high end defenceman early in his rookie year. He has become a force on special teams and brings a unique bag of speed, smarts, toughness and a very heavy shot. He's becoming a quiet leader and is very deserving of the attention and accolades. Walsh played for Team Canada East at the World Junior A Challenge where he had a pair of assists in five games. Last season he played for the Toronto Marlboros and scored 4-11--15 in 35 games. You can follow him on Twitter at @3jwalsh. He was a second-round pick of Missassauga of the OHL. So there's that. While one Buzzer pledged his commitment, another decided to head back to Ontario. It was announced today that Milne had left the hockey team. He had played in just seven games this season and had not tallied a point. From the linked article in The Daily, Red voiced his disappointment but noted that Milne was in good academic standing. He'll be playing for the Owen Sound Attack in the OHL. He picked Michigan over Notre Dame (and Owen Sound). Michigan had liked (PDF link) his skating ability as well as his ability to play at both ends of the ice. I'm not a fan of players bailing midseason, but given Michigan's struggles up front and the fact that he wasn't playing very often, some frustration is certainly understandable (assuming this move is for more playing time). But seriously, F the O.